Bordering the renowned 17th Road Hole of the Old Course, the Old Course Hotel, Golf Resort & Spa overlooks the famous links courses, the West Sands Beach, and the beautiful Scottish coastline. Located just a short stroll from the historic university town of St. Andrews, it is a great vacation spot for golfers and non-golfers alike. As one of Scotland’s most beautiful towns, it successfully blends traditional character with a vibrant mix of outstanding recreational facilities. The town has a burgeoning cultural scene as well as many exciting visitor attractions, excellent shopping, and a collection of restaurants and bars serving delicious Scottish cuisine. Situated in the Home of Golf, this prestigious AA Five Star-awarded resort has 144 guestrooms, including 35 suites, and is recognized as one of Europe's leading resorts. 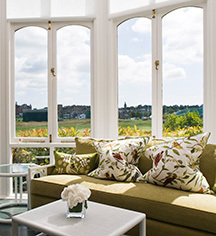 The Old Course Hotel features a combination of classically elegant and contemporary interiors, with French designer Jacques Garcia designing many of the hotel's suites. 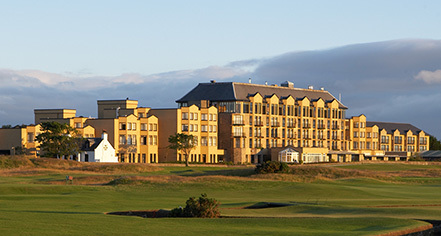 The Old Course Hotel, Golf Resort & Spa boasts its signature Kohler Waters Spa that includes a fitness suite, and offers The Duke's golf course with its spectacular setting above St. Andrews. St. Andrews is home to 11 courses – seven of championship class – including the world’s most famous golf course, the Old Course, as well as the Royal and Ancient, which sets the rules of golf worldwide. The town regularly plays host to major golfing tournaments such as The Open, which is staged every five years in St. Andrews, and the Alfred Dunhill Links Championship, which attracts many international celebrities and major golfing names. Old Course Hotel, a member of Historic Hotels Worldwide since 2017, dates back to the 15th century. Golf became so popular in Scotland that in 1457, King James II implemented a ban on the game to remove it as a distraction; the ban was lifted several generations later and in 1552, Archbishop John Hamilton granted St. Andrews the right to use the land as a golf course. Airport Transportation: Our chauffeur service will be delighted to meet you at your chosen arrival point and can make arrangements for any onward connections. Please advise us of your travel arrangements at the time of booking. Early Check-In/Late Check-Out: Not Available. Hotel/Resort Fees & Taxes: Resort fee is included in overall room price. Shuttle Service: Our chauffeur service will be delighted to meet you at your chosen arrival point and can make arrangements for any onward connections. Please advise us of your travel arrangements at the time of booking. Bordering the renowned 17th Road Hole of the Old Course, the Old Course Hotel, Golf Resort & Spa overlooks the famous links courses, the West Sands Beach, and the beautiful Scottish coastline. Located just a short stroll from the historic university town of St. Andrews, it is a great vacation spot for golfers and non-golfers alike. Learn more about the History of Old Course Hotel, Golf Resort & Spa .